After the death of both of her parents, troubled farm girl Penny Houten ends up being befriended and taken care of by Susan Whitfield. Susan's family and friends become Penny's family and friends, all but one sleazy politician named Justin Groome who Penny just can't seem to trust or stand to be around. One night after a party when something terrible happens, Penny is blamed but only two people know the truth, one of Susan's sons who cowardly lies in favor of Justin Groome and Justin Groome himself. In order to clear her name and prove she is innocent, Penny runs away without even saying good bye to Susan or anybody else and takes on a whole new look and the name of Lark Chandler. It takes years, but Lark finally reunites with the man she loves and had to leave behind but there's a problem, he doesn't know she is really Penny and Justin Groome is still out to get her to make sure she never talks about that night to anyone but all Penny wants is for her story to be told and she will go through great lengths to make it happen. I absolutely loved this book from beginning to end and loved how all of the characters brought something special to this story. It was a very fun book to read, taking the readers to many different places spanning thousands of miles. 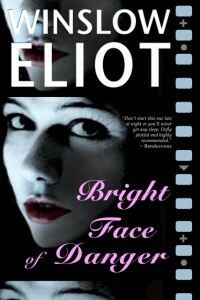 This is the second book by Literary Award Winner Winslow Eliot that I have read. The other was Heaven Falls, for which she won the award. Heaven Falls was a very well written story as well which I really enjoyed. Winslow writes wonderful stories and I can't wait to read what she comes out with next. In case you want to learn more about Winslow Eliot and her work, you can follow her on Twitter or check out her wonderful blog.